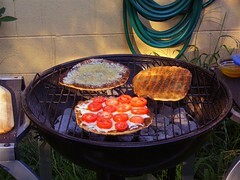 I decided to use a recipe for grilled pizza dough from Cook’s Illustrated magazine (no. 75) as my starting point. 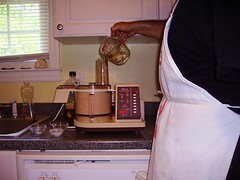 If you have not experienced Cook’s Illustrated, I highly recommend it for its no-nonsense approach to recipe creation, its wealth of tips and techniques, and its honest equipment and ingredient tests. If you’re interested in how a good recipe gets built, you should definitely check it out. They’re not even paying me to write all this! The original recipe calls for bread flour rather than white wheat, but I’ve been experimenting with this new product. It’s a real whole-wheat flour, but made of white wheat berries instead of red wheat. It has a taste that’s something like a cross between regular flour and traditional whole wheat–nutty, but light, and with a finer grind than traditional whole wheat. Like regular wheat flour, it can be tough to get a workable dough out of it. The addition of the vital wheat gluten (not called for in the original recipe), which is a powdered form of the natural protein in wheat that gives doughs their elasticity, helps improve the texture and workability of the dough. Thanks to the instant yeast (which comes in smaller pellets than regular yeast and “activates” more quickly), you don’t need to do any proofing to get the yeast to wake up. This makes for a very quick dough. 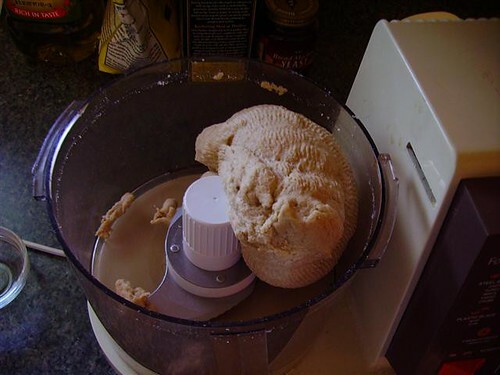 The recipe went even quicker since I used The Machine to put the dough together. 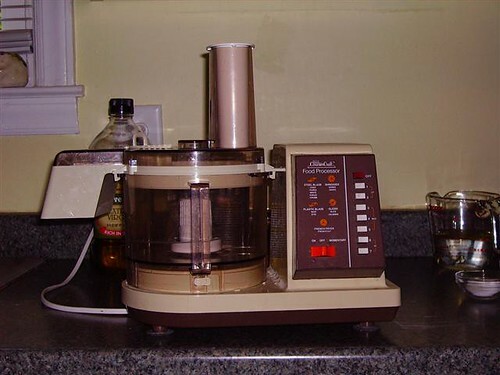 This is The Machine, my ancient beast of a food processor. I picked it up at a yard sale for cheap–little did I realize that this was because it is inhabited by the soul of a wailing banshee. Despite the noise, it does a pretty good job of actually mixing food together. Of course, I wouldn’t say no if an 11-cup KitchenAid food processor showed up at my door through the generosity of a mysterious benefactor of some kind…. 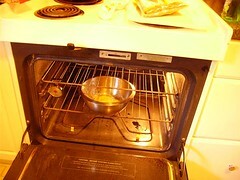 For this recipe I equipped it with the regular metal blade, though a dough blade would have done just as well. 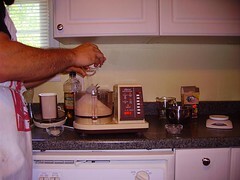 For the first step in bringing the ingredients together, I put all the dry stuff–flour, gluten, yeast, sugar, salt–into the workbowl of The Machine, and gave it a quick whirl. Then, with the machine still running, I drizzled the water and oil slowly down the chute and waited until the dough came together. It took about two minutes for the dough to come together into a mass–a sure sign that such a dough is done is when it comes together into a vaguely ballish shape and starts cleaning off the side of the bowl as it spins. 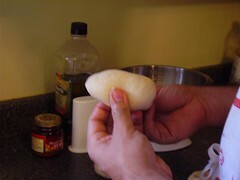 (If you’re doing this at home and the dough seems too wet while it’s spinning and never forms a ball, toss in small portions of flour until it comes together.) The dough was a little sticky and wet at the end. Now it was time for the dough to rise. I turned it out into a metal bowl I had greased with a little olive oil and covered it with plastic wrap. 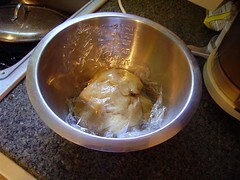 Then I stored the dough in a draft-free, warm place for about an hour and a half, until it doubled in volume. You, too, can have the same results. Consult your medical professional. 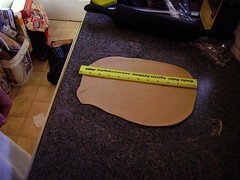 Once the dough was doubled, I pressed it down a bit, turned it out onto the counter (or “work surface,” in chef-speak), and cut it into four equal portions. 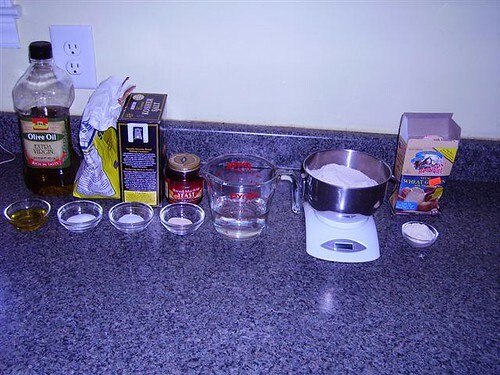 The kitchen scale was helpful in making sure the dough-ettes were equally sized–if you haven’t got one, it’s something that’s worth having, especially if you bake a lot or do any kind of portioning. 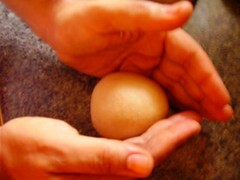 After the dough was split, I folded the edges of the dough under the doughball, to create a tight, smooth surface. I repeated for each of the other dough nuggets. 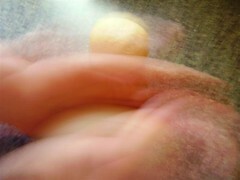 Then I rolled each of the mini dough balls on the counter, between my vertically-placed hands (see picture). 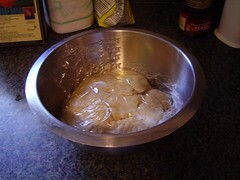 This helped to tighten up the dough ball further. 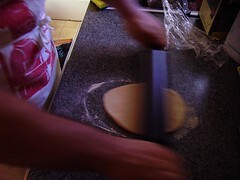 These steps help keep the dough uniform when it is rolled flat later. After I balled all of the dough, I smooshed each one down a little and covered them with a piece of plastic wrap, then let them rest for a few minutes while I prepared other ingredients and lit the coals for the grill. Our ingredients for the night were simply shredded cheese and tomatoes for me, and Ragu marinara and cheese for the Picky Epicurean. 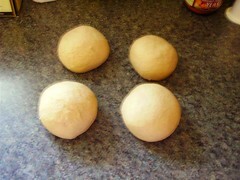 The remaining two doughs were slated to become flatbread, and would be brushed with olive oil and sprinkled with garlic. I will cover how to prepare wet ingredients like tomatoes for use as a pizza topping in tomorrow’s post–keep an eye out for it! Now it was time to roll out the dough. 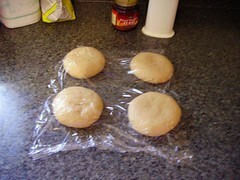 Because thin dough spots could burn easily and spell trouble on the grill, I used a rolling pin to roll out the dough. I was basically aiming for “big enough” as I rolled them out; upon measurement they turned out to be about 8″ by 12″. Someone with mad rolling pin kung-fu could probably have gotten a nice 10″ round. But not me. Time to start grilling. I built my fire in a standard “two-level” layout (see the entry on Grilling Basics for more info) and then closed the grill to let it preheat for a few minutes–this ensures nice grill marks. For that matter, I think I got impatient while preheating, because my grill marks were paler than my non-grill marks. Next time I’ll have to restrain myself. (I have a similar problem at Indian buffet.) Then I slid the dough onto the grill using a pizza peel tht was lightly floured, to ensure that the dough slid off the peel easily. The grill fit two pizza doughs over the hotter portion of the fire pretty comfortably. Unfortunately, I neglected to take photos of any of this–I’m not very practiced at this yet, so I hope you’ll forgive me. first I put on the grill) got a little overcooked. It still tasted okay after I scraped off the char with a butterknife. Some pointers on toppings: Grilled pizzas are less tolerant of heavy and wet toppings than their standard counterparts–you definitely don’t want a wet crust, and you don’t want the pizza crust to crack under the weight of the toppings as it moves around. Try to pick drier ingredients or to remove moisture from ingredients that usually cook up wet–it’s wise to use tomatoes in lieu of sauce for this reason, though I didn’t have any problems with the Epicurean’s sauced pizza. As far as vegetation is concerned, it’s important to pre-cook things like mushrooms and onions if you want them to cook through on the grill. Also, use a far sparser hand with both cheese and toppings than you would with a regular pizza. (The pizzas I made were probably over-topped, to be frank.) Putting the cheese directly on the crust will help to create a moisture barrier between the crusts and any wet toppings and prevent sogginess. To finish the pizzas, I placed each pizza back onto a floured peel before dressing it. I built the pizzas on the peel so that I wouldn’t have to move the pizza much after dressing, and it was important that the peel be floured so the pizzas would actually slide off when the time came. I covered the cooked sides of the crusts with their respective toppings, then slid them onto the grill. The grill needed to be covered so that the cheese would melt, and although the pizzas still required careful checking, they were a little more resistant to browning on the second go. I think this is because the toppings were there to absorb some of the heat–the flatbreads, having fewer toppings, were in a little more danger of burning and required a careful eye. The same basic technique applied for the topped pizzas as did for the crusts: check the underside, and if it looks like something is going to burn, move it to the cooler side of the grill. 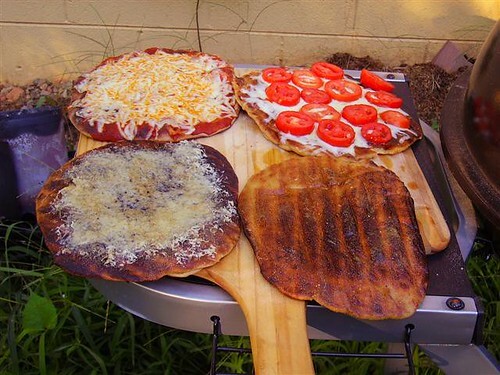 It may be wise to resist the temptation to throw all four pizzas on the grill, so that you can move things around in case they get too hot. The final results are shown below. These pizzas were delicious, with crisp, chewy crusts and nice grilled flavor throughout. 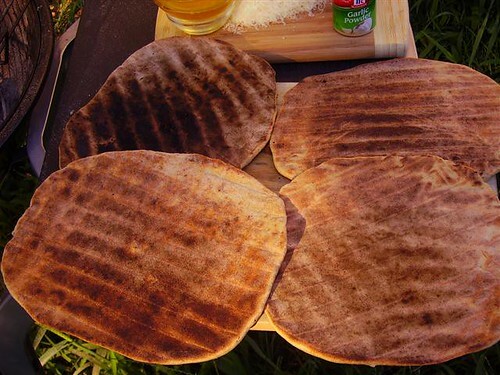 One of the flatbreads got a little burned on the second side (luckily, the same one that got burned on the first side–maybe I rolled this one too thin?) but it still tasted pretty good. I encourage you to try this recipe–it’s pretty quick once the doughs go on the grill, so if you make the dough ahead of time it’d make excellent outdoor party fare. Clockwise from the upper left: the Picky Epicurean’s Ragu and cheese pizza, my tomato and cheese (looks like I’m losing a tomato! oops! ), garlic and oil flatbread, Parmesan flatbread. i have to say – the pizza was really nummy – but the flatbread with the garlic oil on it? c’est magnifique! The flatbread with garlic oil was somehow more than the sum of its parts. I’m a bit bummed that I forgot to put avocado on my pizza, but I’m not sure it would have fit. Hello, Love the blog and the recipe. The pics are great. I just grilled some pizza on the BBQ and thought I would pass it on. Please come by and take a look when you have a chance and let me know what you think.